The sunny climate matches the city's inhabitants disposition which extends to its exciting culinary, commercial and cultural offerings. New Zealand's largest and most diverse city is a must-see. The adventure capital of New Zealand (and perhaps the world), Queenstown is anything but reserved and demure. Travellers looking to get an adrenaline fix need look no further than this city that has more adventure options than you knew existed. Jump out of a helicopter and hit the slopes on skis, zip-line at incredible speed, skydive above a beautiful landscape, hit the rapids on a river raft or just go bungy jumping in the city that birthed the activity - there is more than enough to keep the heart pumping here. Don't think this is all the city has to offer, however. With a cosmopolitan culinary and arts scene. Sitting on the shores of the crystal clear Lake Wakatipu among alpine mountain ranges, it is easy to see why the origin of the name of the town is thought to be an attempt to capture and appreciate the majesty of this great city. At the southern end of the North Island, resting on a harbour surround by mountain ranges - Wellington is one of the most attractive cities in New Zealand. The city, though comp[act, is filled to the brim with vibrancy and a healthy dose of creative energy. Arguably nowhere in New Zealand can you enjoy culinary exploits as much as you can here with a proud coffee, craft beer and casual dining culture. The compact nature of this city makes it relatively simple to explore the many theatres, museums and galleries in the New Zealand capital. Just watch out for the wind, the city is infamous for its epic gales that may blow your flat-white right out of your hand. Of late, this city has been associated in the public imagination with the devastating earthquakes that struck the city a few years ago. But this city is now one of the best places to explore and appreciate the resilience and indomitable spirit of the people of New Zealand. Where there was once destruction and rubble, every day exciting new sights and buildings are being opened at an astounding pace. Every day you spend here will surprise you and travellers here will be afforded the opportunity to enjoy completely new experiences as well as contribute to the establishment of what will inevitably be one of the most modern cities in New Zealand. 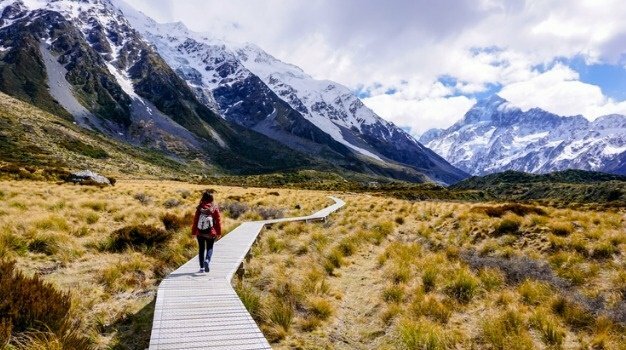 If going to a brand new restaurant, art gallery or coffee shop isn't enough, the Pacific Ocean and the Southern Alps are within driving distance for travellers to enjoy and revel in. Mount Taranaki serves as a dramatic backdrop (and a reminder of the great hiking options) to this city in New Zealand. Like many of the other port towns, the world comes and goes as regularly as the surf which has lent the locals with a particularly global mindset that travellers will appreciate. New Plymouth is known for its emerging arts scene, great beaches and lush parks.